Root canal therapy (RCT) is the process of treating a deeply infected tooth by removing the infected matter, sanitizing the root canal, filling the area with an inert material, and resealing the tooth, thereby preserving the original tooth. The procedure was first developed over 200 years ago. The advent of modern anesthetics made the procedure more practical. During the last 20 years, modern technology and new methods have vastly improved the treatment success and patient comfort levels. At Precision Dental in Fortitude Valley, we are constantly being updated and we regularly attend specialised seminars to stay abreast of the newest technical procedures and methods in the science of root canal therapy. 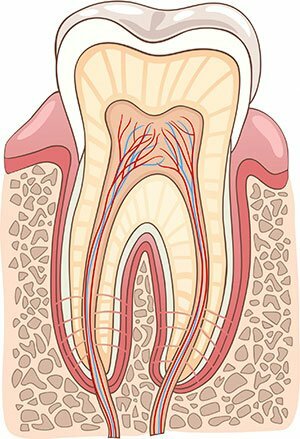 The root canal: the hollow centre of the tooth which extends from the base of the roots to the centre of the tooth, and is filled with a soft, organic material, dental pulp, that contains blood vessels and nerves which supply nutrients to the tooth. It is when the dental pulp becomes infected that RCT becomes necessary to save the original tooth. Preserving your natural teeth is always preferable to alternative tooth replacement options. The pain can be sharp, intermittent, constant, localized to one tooth, extending from the jaw back to the ear, throbbing, inflamed gums, sensitivity to hot or cold foods, but almost always impossible to ignore. This pain is your signal to immediately contact your dentist. The longer you wait, the more the infection will progress and the more difficult it will be to treat. Putting off a dental examination can have serious consequences and might mean the difference between saving the tooth or losing it. The concept of RCT is quite simple, however the procedure is somewhat complicated and requires a highly skilled dental professional. Dr Billy Choi at Precision Dental has been preforming RCTs for over 10 years and is uncompromising in his devotion to meticulous, high quality dental practices. You can expect at least two dental visits for this procedure, and possibly more, depending on your particular situation. Rest assured, the professionals at Precision Dental are on your side and want you to enjoy the highest oral health and long lasting, trouble free dental solutions. Precision Dental offers the most modern, effective, pain-free dental services and will provide you with the most convenient and comfortable dental treatments possible.